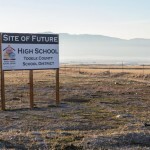 The intersection of Tooele City Main Street and 400 North was strewn with vehicles and debris Monday morning after a suspect crashed a stolen Mitsubishi Eclipse while trying to evade Tooele County Sheriff deputies. After allegedly running a red light at the intersection, the Eclipse was broadsided by a northbound black SUV before colliding with a white Jeep and a red Nissan SUV. 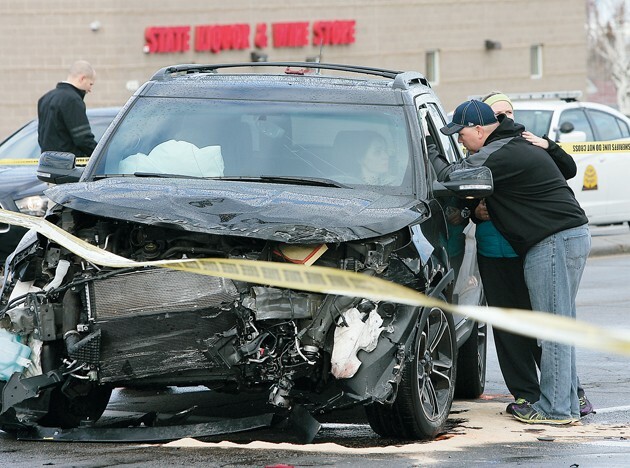 A red Nissan Pathfinder driven by Monty Sternberg, traveling with his two children, was the last vehicle hit in Monday’s high-speed chase at the intersection of Tooele City Main Street and 400 North. Sternberg and his children weren’t injured, but three others were sent to local hospitals. 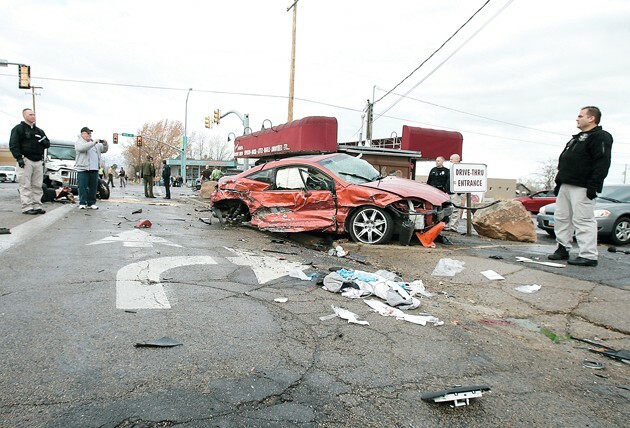 A high-speed chase Monday morning ended in a four-car accident on Tooele City Main Street that injured three and damaged a business. Tooele County Sheriff’s deputies were pursuing a stolen Mitsubishi Eclipse when the suspect, Marcello Anthony Aragon, 23, of Tooele, allegedly ran a red light on Main Street while heading eastbound on 400 North. Aragon’s car was broadsided in the intersection by a northbound black SUV before colliding with a white Jeep and red Nissan SUV stopped in 400 North’s westbound lanes. The Eclipse was reported stolen to Tooele City Police from a home on Griffith Street at 7 a.m. Monday. Around 8:30 a.m. an animal control officer spotted the stolen car. A deputy located and pulled in behind the car but Aragon fled when the deputy turned on its top lights, said Tooele County Sheriff Paul Wimmer. The chase, which began at 9:17 a.m., only lasted five to six minutes, Wimmer said. Speeds reached at least 60 mph and went through the Grandview Village mobile home park and a field. “The pursuit wasn’t very long,” he said. 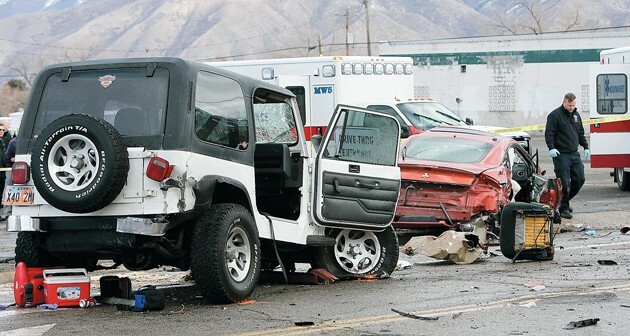 A man and boy in the Jeep were taken to a Salt Lake area hospital by ambulance. Aragon reportedly sustained significant injuries and was airlifted by a University of Utah medical helicopter and arrived in critical condition. A total of eight people between the four vehicles were involved in the accident. Monty Sternberg and his two children were in a red Nissan Pathfinder that was the last vehicle involved in the accident. While their SUV sustained heavy front-end damage, no one in the vehicle was injured. Sternberg, whose SUV was stopped behind the white Jeep, said he didn’t see the oncoming car until it was too late. Janna’s Java, located at the northeast corner of 400 North and Main Street, sustained significant damage from the accident. A tire from one of the vehicles shattered two windows and damaged the interior of the coffee shop but no baristas or customers were injured. Barista Shayla Martin said she was walking away from the counter as the accident occurred. While she didn’t see the accident, Martin said the noise was tremendous. 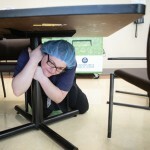 “It sounded kind of like a bomb went off,” she said. Owner David Millard said Janna’s Java installed large rocks near the front left corner of the store due to its proximity to the intersection. Millard said the shop recently installed new security cameras that may have captured video of the accident. A video camera from across the street captured the accident and has been posted online. It shows the Mitsubishi Eclipse traveling through the intersection and colliding with vehicles. The Utah Highway Patrol is conducting the accident investigation. Main Street was closed between 500 North and Utah Avenue following the crash. The intersection reopened just before 1:30 p.m., according to Tooele City Police. 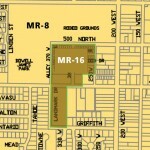 The crash and vehicle theft remain under investigation. Wimmer said Aragon will likely face charges of motor vehicle theft and fleeing while causing property damage or bodily injury, both second-degree felonies.